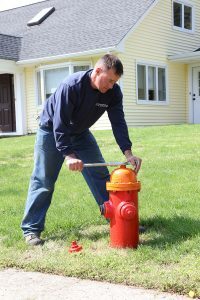 Do not forget to keep fire hydrants clear of plants and shrubbery during summer months, and free from snow and ice all winter long. A blocked hydrant can cost firefighters precious time in an emergency. If you see a hydrant open or leaking, please report it immediately to the District office at (516) 767-0171. Remember, NYS Vehicle Traffic Law requires no parking within 15 feet of either side of a fire hydrant.